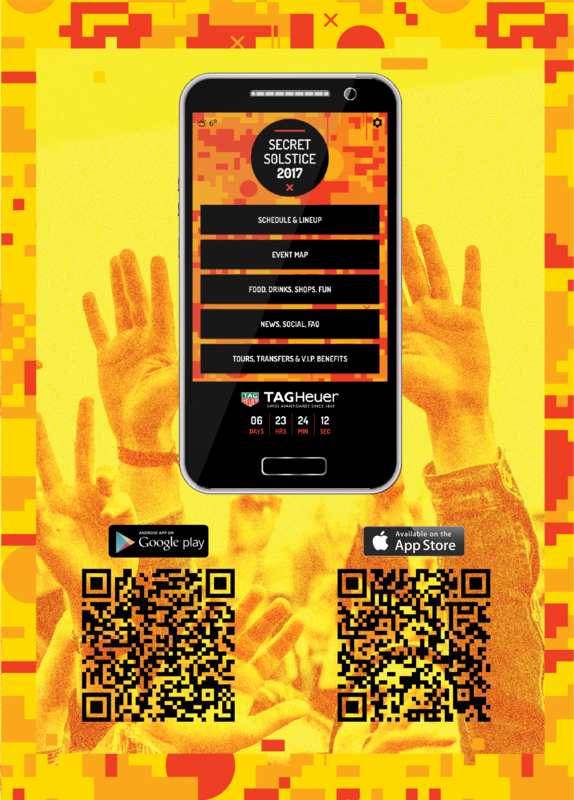 The OFFICIAL Secret Solstice 2017 app is LIVE, with artist schedule, timings and more! Get it NOW and start planning your Secret Solstice weekend. ? Also all ticket holders should have received the Secret Solstice customer information document. Click here to download it. If you did not receive the customer information document via email click here to download it. Below are highlights from the document. Your festival ticket, either as a hard copy or on your phone. You will need to have the bar-code to be able to get your wristband, so this is crucial! Please note that there will be no wifi by the main gate, so don’t forget to take a screenshot before you get to the site. Bring photo ID if you want to consume alcohol – remember the legal drinking age in Iceland is 20 years old. Professional photography and/or videography equipment without a media pass (detachable professional zoom lenses, stands or other commercial equipment). Outside food or beverages (including alcohol) of any kind, except 2 factory sealed bottles of water (up to 1 liter each). Drones, skateboards, bikes, fireworks, graffiti or painting supplies. Tents, chairs, or hammocks, unless you are staying in the campsite. 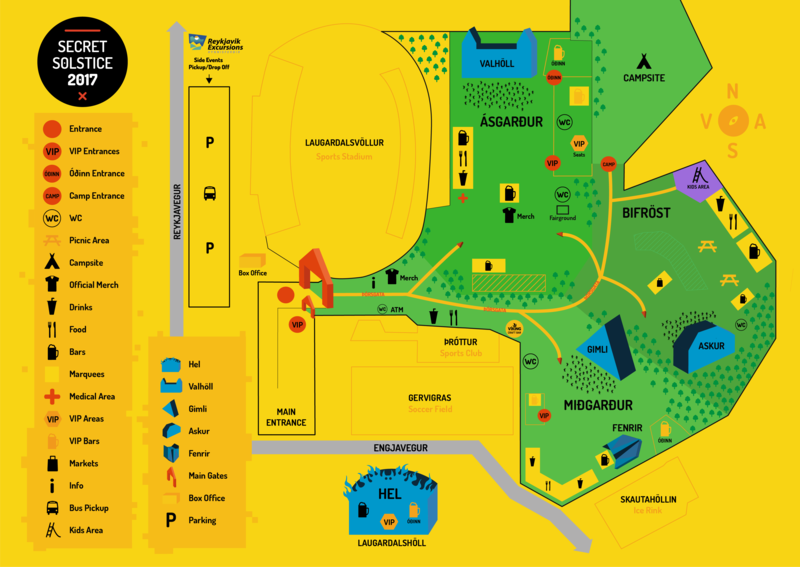 Secret Solstice is located next to the centre of Reykjavik (map). A taxi from downtown to the festival site will only cost you around 1400kr, or you can take in the views and walk there in under 20 minutes, depending on where you’re staying. There is no on-site festival parking available for guests but alternative parking can be found a few minutes walk from the festival site. You can purchase festival passes via our ticketing agents here, subject to availability. Children under 10 can attend for free as long as they are accompanied by a fully paying guardian who is over the age of 20. Children between 11 and 17 must pay for a full adult ticket, and must also be accompanied by a guardian over the age of 20. Anyone who is 18 or over can attend as an adult, but must be over 20 to purchase or consume alcohol (inline with Icelandic law). To avoid being asked for ID every time you buy a drink we recommend going to customer info at the festival and picking up a ‘Proof of age’ wristband. At Secret Solstice we’re not just known for our amazing festival, but also for our groundbreaking side parties. All side events have the same departure location. This is outside the Laugardalsvöllur National Stadium, around a 100m walk to the north of our festival’s main gate. 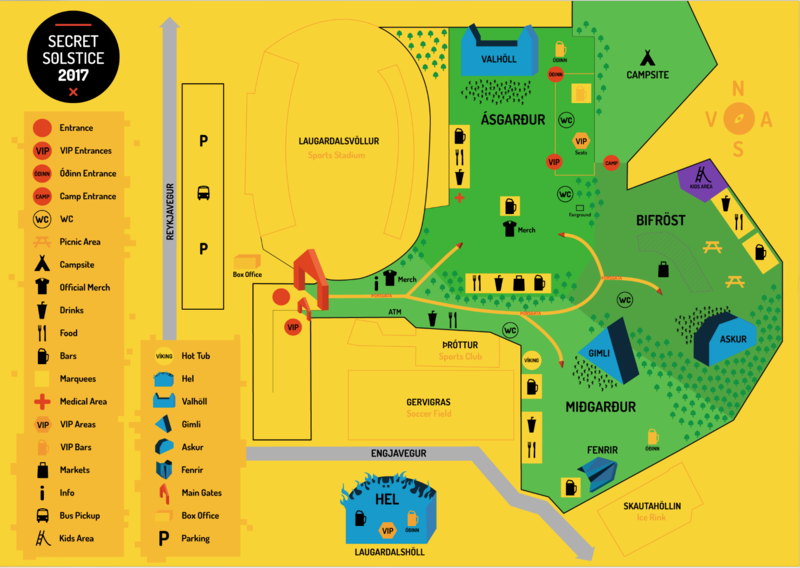 Please check the official festival map here for the exact location. As a festival, we take your safety very seriously. On-site you will find our wonderful security team who are there to look after you. Please approach them with any issues, ask them any questions and request help with anything you may need. On-site we have both a medical centre and a welfare facility. Both are staffed with fully trained workers that are there to help with anything from blisters to more serious medical emergencies. Secret Solstice is proud to be certified CarbonNeutral® event in 2017. This has been achieved through a verified carbon offset plan, as well as all on-site energy needs for production and sound being provided by 100% renewable geothermal power. We have a dedicated recycling team at the Secret Solstice 2017 site. We ask that you help us leave the smallest impact on the environment possible, by recycling as much as you can during our 2017 event. Frequently asked questions can be found in the full customer information document. Click here to download it.